This wizard may be small in size, but he is big on detail! 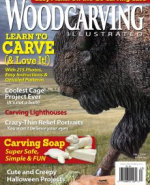 So much detail in fact, we simply couldn’t fit everything in Woodcarving Illustrated Summer/Fall 2016 (Issue 76). 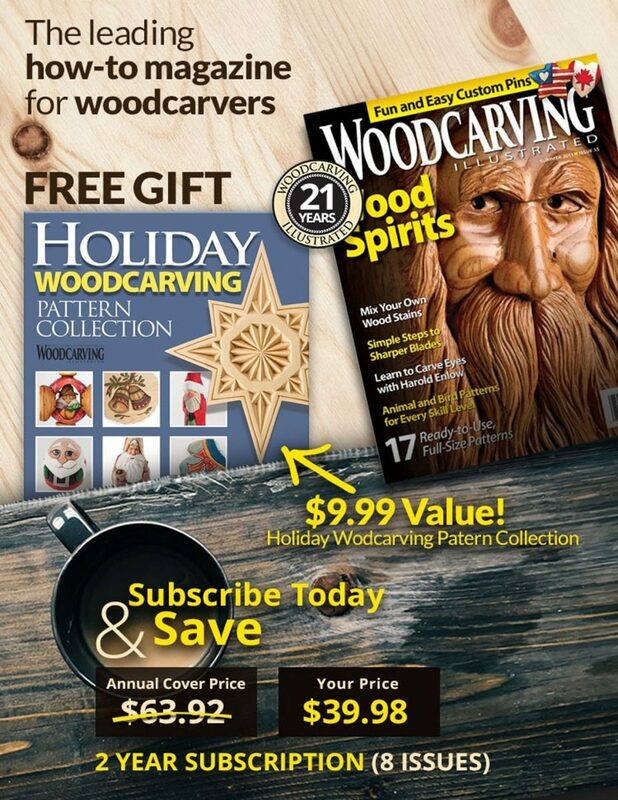 While full carving instructions are available in the magazine, you can apply these painting instructions to nearly any wizened figure. . When using acrylic paint you can choose to apply it to either a damp or dry surface. Paint on a damp surface when you want to blend colors. Paint on a dry surface to prevent bleeding between adjacent areas of color. Begin by spraying the carving with water and wait a few minutes until the carving is damp, not dripping wet. Apply a wash of fleshtone (1) to the face and ears. 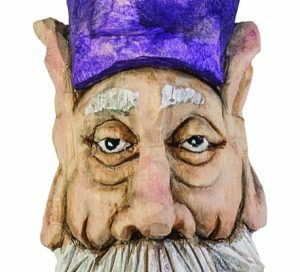 While the paint is damp, use a thin wash of asphaltum brown (2) to create shadows around the eyes, nose, ears, and under the brim of the hat. Be careful not to add so much that your wizard now has a tan! Add a bit of thinned true red (4) to the cheeks and ears. Use a blow dryer to completely dry the carving and set the paint on the face and ears. Paint the eyeballs with Magnolia White. Blow dry when finished. Apply a dot of Black to the irises. Blow dry the paint. Apply a tiny dot of Magnolia White near the bottom of each iris to indicate light reflections, and blow dry. Apply a thin wash of asphaltum brown (2) to the beard, paying special attention to the crevices. Blow-dry the paint. Apply washes of butter cream (1) in strokes along the flow of the hair while avoiding the little crevices. Imagine what the hair color was before the wizard got old and it turned white; the beard should look white with the asphaltum brown (2) as an accent. Blow dry the beard, and then dry brush it with magnolia white (1). 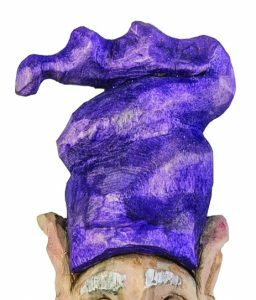 Paint the hat with a wash of dioxazine purple (4), letting extra paint seep into the areas around the ears and under the hat. Don’t try to paint right onto the dividing line between different paint colors; get close and let the paint creep up to the edge. Use a little extra dioxazine purple (4) to darken some of the shadows on the hat. Blow dry when finished. Spray the carving with water until damp. Apply washes of black (3) to deepen the shadows in the face, beard, and hat. Lightly touch the brush to a crevice to let the wash flow into it. Use a larger brush with clean water to blend or erase the black if you add too much to an area. Blow dry the carving. 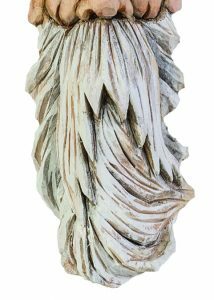 Once the paint is dry, use a brush to heavily coat the carving with oil-based satin polyurethane, such as Minwax. Let the finish soak for about a minute and then blot any excess off with a clean paper towel. Do not add additional coats of the finish to prevent the carving from having a glossy appearance. 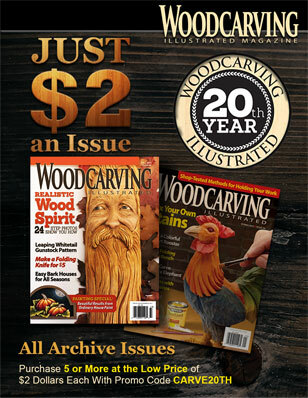 For more information about caricature carving read Carving Fantasy Characters by Floyd Rhadigan. 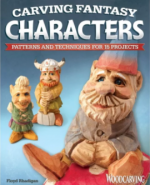 Learn to carve 15 different lighthearted fantasy characters such as an elf, troll, pixie and more with detailed patterns and instructions. It is available for $16.99 plus S&H from www.foxchapelpublishing.com.